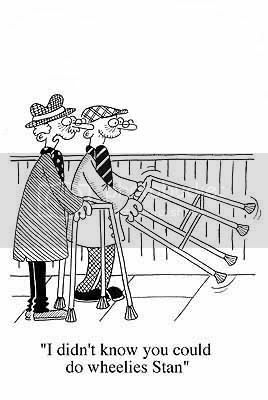 Utilise old Zimmer frames, by attaching spikes to the bottom of their legs. You may now move around the garden collecting three to four times the amount of leaves that you would normally collect with a single pronged stick. Maybe good, even for that "after the garden party" litter collection. Zimmy frame? Super fast deluxe apparatus. Maybe someone could draw a Zimmer halftrack with attached pan -- it could be adapted to sweep carpet floors or buff hard floors while being moved about.